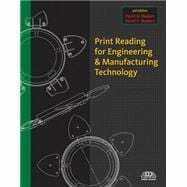 This enhanced edition of PRINT READING FOR ENGINEERING AND MANUFACTURING TECHNOLOGY 3E takes a practical approach to print reading, with fundamental through advanced coverage that demonstrates industry standards essential for pursuing careers in the 21st century. Readers will learn step-by-step how to interpret actual industry prints while building the knowledge and skills that will allow them to read complete sets of working drawings. Realistic examples, illustrations, related tests, and print reading problems are based on real world engineering prints that comply with ANSI, ASME, AWS, and other related standards. Included in this new edition is material on electronic filing, discovery, the duty to prevent spoliation , pertinent rule changes and coverage of the HIPAA standards that facilitates readers' understanding of the importance of these relatively new areas of practice. Thorough updating of the law, changes in rules of procedure, evidence, and ethics standards keeps readers current on changes in the law and practice.